(Posted 09/14/09 www.RemnantNewspaper.com) Nestled among the lush green vegetation, the crops of yam, cassava, plantain, papapya and pineapple, and beneath the extreme heat of the year round tropical sun, the summer downpours and the choking dust of the dry season—sits the Nne Enyemaka Shrine in the centre of Igboland in Southern Nigeria. Not just another one of many small chapels in the mainly Catholic heartland of Nigeria’s greenbelt, this is an oasis of Catholic Tradition in a land tragically succumbing to the desertification of liturgical inculturation in Africa. The Shrine is the only personal parish for the Traditional Latin Mass (TLM) on the continent, a generous parting gift to the Priestly Fraternity of Saint Peter (FSSP) from the then departing ordinary of the Orlu Diocese, His Lordship Gregory Ochiaga. The shrine was erected to Our Lady of Perpetual Help as a diocesan shrine on the grounds of an existing parish on August 15th 1988. Twenty years later to the day, it was inaugurated as a personal parish under the watchful eye of its new pastor, Fr Evaristus Eshiowu, FSSP. Fr Eshiowu had been a priest of the Orlu Diocese for sixteen years before joining the FSSP after a stint in the USA where he’d grown increasingly disenchanted with what he was witnessing liturgically. Fr Eshiowu returned to Nigeria in 1988 and was made rector of the shrine on its tenth anniversary. The following year he applied to join the FSSP. Bishop Ochiaga allowed him to say the Traditional Latin Mass at the shrine once he had been fully trained. Thus in 2001, and in response to the Ecclesia Dei adflicta (1988), Bishop Ochiaga introduced the TLM in his diocese. One of his last acts before retirement was to announce publicly that the shrine was to become a personal parish for the FSSP. It was inaugurated on 15th August 2008 by the new bishop, His Lordship Augustine Ukwuoma. Nigeria is a vast country which is heavily populated in the south amidst jungle, oil fields and sprawling, noisy, dirty cities. Yet like all of Africa, it is also deeply religious. Missionary activity began in earnest, however, only toward the end of the 19th Century and was eagerly accepted by Nigerians. To this day it has not abated. The main change, however, has been in the means of missionary activity. In general a large proportion of Igbo are Catholic, and, technically, they remain so, yet in the last twenty years there has been a disproportionate increase in evangelical Protestant activities throughout Africa and especially amongst the Igbo. The result manifests itself in large numbers of parishes throughout the region where Catholic priests find themselves competing with entertainers and charlatans in order to fill pews. Unfortunately this scenario of playing the game at the level of the lowest competitor is a lose-lose situation for the Catholic Church since the opposition is not bound by any rules or regulations and will thus always be able to perform new tricks. Implement as much clapping, dancing, inculturation, and cheering as they want, however, it still fails to keep the key ‘next’ generation of 18-30-year-olds from attending, and the numbers do not replenish themselves. On the other hand, when it comes to the Traditional Latin Mass just the opposite is true since many of those disgruntled parishioners come looking for some silence, prayer and liturgical sanity. For some of the priests of the Fraternity there is a sense of déjà-vu to all of this since it feels very much like the 1980s in the West, with one family playing Russian Roulette and the other sheltering those who survive the onslaught. Yet there is more greenery in this African scene than in the dark days of the 70s and 80s. Although Summorum Pontificum is a (so we are informed) “Westerner-only” concept that is kept far away from most Africans, and, as such, not yet publicised, interest in the TLM is increasing as is interest in the daily Masses and missionary apostolate of the FSSP. The Sunday Mass in Port Harcourt is also a success as are the weekly Masses in other neighbouring parishes. Thus there are ever increasing numbers of requests to the bishops in Igboland for the Traditional Latin Mass. However, things are different here. A bishop in a Western country holds an office of some dignity and a certain amount of public respect (depending on the country). In Africa and especially in this region of Nigeria a bishop’s status can threaten low flying planes and even a few higher ones! His position is more exalted than that of all local ‘Kings’ and the respect he commands is total. Needless to say, when members of the diocese claim their rights under papal Motu Proprios those ‘rights’ are often seen as an attempt to undermine the only RIGHT in the diocese that matters. And as anyone who has ever driven in Africa can tell you, the only road rule is “the biggest vehicle owns the road”. In this case that’s the bishop! Up until now this has led most tradition-minded Catholics to keep their ideas to themselves and not challenge a power that appears unchallengeable. Yet gradually and through the support of Ecclesia Dei Nigeria some of these groups who are treated as if SP doesn’t exist and that even to question the Bishop about the Latin Mass is taboo, are becoming informed and confident enough to stand up for the rights they so dearly desire. No doubt this will lead to some friction, yet perhaps the recent merging of the Ecclesia Dei Commission with the CDF may give more teeth to a letter sent to Ecclesia Dei than was formerly the case. Time will tell, and no doubt a few tempers may fray before we know. 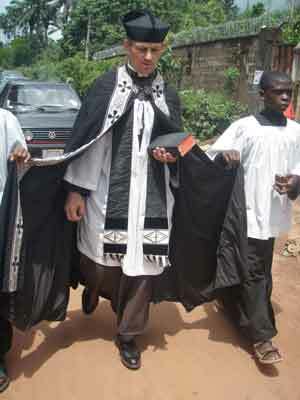 Nevertheless, the work of the FSSP goes on, and, as part of their pastoral work, the two priests—Father Evaristus Eshiowu and Father Antony Sumich—go out into the villages and administer the Sacraments when the faithful are unable to make it to the shrine. 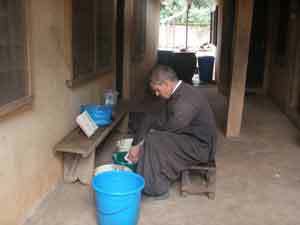 An elderly man in a village recently was heard to say that this “white priest” was the first priest he had seen paying visits to the villagers since the missionaries were evicted in 1970. The fight against the festivalising of funerals has been very successful thus far, and by banning all excesses of worldliness and replacing them with traditional rosary vigils and processions, a large increase in attendance at funerals has been already realized but not without a few raised eyebrows from those who make financial profits from funerals. The recent practice had been that families would delay funerals (sometimes for months) in order to raise the money for a big “send off” celebration. Now, however, people who are seeing a far more holy and dignified funeral at the FSSP shrine and at a fraction of the cost are beginning to weigh the pros & cons. May common sense and grace prevail. The confessionals are where the FSSP priests are really working hard. With daily confessions and no demand that the penitent produce a parish ID with a stamp to prove he has contributed to the parish, the priests are inundated with requests for confessions, especially on the weekends. No doubt sitting in a hot box, wearing cassock and surplice, and watching mosquitoes buzz around one’s ankles and neck while hearing confessions for hours on end is a great sacrifice, but a great source of supernatural grace as well. It is just that sort of priestly presence—in the confessional, out amongst the faithful, walking though the villages, making the processions to pray for fine weather, blessing new crops or houses that need purifications, or just attending to the needs of the sick—that has always put the Catholic priest close to the common man, and it is no different here in Africa. And so the work goes on. One day at a time, one traditional Mass at a time, one soul at a time—Catholic Tradition is being replanted here in Africa. Thanks be to God! Certainly the vast majority of Remnant readers will celebrate the fact that such traditional Catholic missions are once again springing up all around the world. Perhaps understandably, however, a small number may still be tempted to react to this story with bitter reminders of a 21-year-old debate, competing priestly fraternities, and a lot of muddy water under the bridge. Let’s be perfectly candid: In 1988 very serious developments in the Church put very serious men at odds with one another for very serious reasons. I have no wish to minimize what happened. I lived through it and remember it well. My father took a difficult stand at the time that cost The Remnant 5,000 subscribers. Like the War Between the States, it pitted brother against brother, son against father, daughter against mother. This is undeniable. But neither can it be denied today (even as Bishop Fellay prepares to take to the Throne of St. Peter the very doctrinal disputes at the heart of the events of 1988) that over the past twenty years a two-fronted, worldwide Catholic restoration movement has begun to influence not only the course of the Barque of St. Peter, but also the future of a world at war with God. In hindsight and despite ongoing differences of opinion over traditionalist strategies and priestly fraternities, honest men and women can see the hand of God and the workings of His grace on both sides of the great “civil war” within Traditional Catholicism. In its third decade of operation, the Fraternity of St. Peter, for example, also founded by spiritual sons of Archbishop Lefebvre, has developed its own charisms and no longer lives and breathes in the shadow of the Society of St. Pius X. For the most part both the SSPX and the FSSP are manned by a small army of courageous young priests who were boys in 1988—too young to carry old grudges. Father Sumich was ordained for the FSSP only a year or so ago. A New Zealander of Croatian descent, he was a rugby star not all that long ago. While living in Croatia for six years he’d even coached the Croatian national team for a time. But then he heard a silent voice calling him to the priesthood, to Tradition, to the FSSP and finally to Nigeria where today he labors in fields far removed from those he used to run with a Steeden in his hands. In these new fields the object of the game is to preserve the Faith and save souls. Yes, but does he criticize Vatican II enough? Given the worldwide crisis presently at hand, where Christianity itself is coming under the heel of a global Super State, I wonder if we might all agree to let that stale bit fall by the wayside. The legacy of Vatican II is in such critical condition that even the Pope believes an emergency injection of “hermeneutic of continuity” is required to save it. The failings of its ill-fated “Spirit” are everywhere manifest today, so much so that many good priests are simply moving on through the ruins, pulling rubble off of high altars, gluing broken statues back together, dusting off the old Missal and providing sanctuary to homeless Catholics the world over. It’s called “Catholic Restoration”. They’d been sent to, as Waugh puts it, care for “distressed consciences” by providing the Sacraments and the old Mass. They went only when and where they were invited by Catholics who needed them, much like the FSSP does today. Even Campion's famous "Challenge to the Privy Council"—Campion's Brag— was written before his capture with instructions that it be made public only in the event that he was captured. Why? Because Campion and his friends, ever the brilliant strategists, "feared that they might be taken and summarily executed without having the chance to plead their true intentions; the Government would be able to give their own account, forge confessions of treason, and no one would be in a position to contradict them. " Until such time as their arrests, however, their mission was simply to “preserve and augment the faith of the Catholics in England”—the greatest missionary work of the Catholic counterreformation. The Catholics, concerned very little with matters of high politics and very much with their ordinary day-to-day relations with their neighbours, accepted [this clarification] eagerly, as permission to deny the royal authority only in so far as it forbade them the practice of their religion, and in all other matters to arrange their lives in harmony with their fellow-countrymen. It was in this sense only that the question interested Persons and Campion. Wasn’t that just ‘going along to get along’? No proselytizing? No speaking out against the Queen? No lambasting the new religion? Hiding in “priest holes”? Aliases? When St. Edmund Campion went back into England he did so as “Mr. Edmunds” and wore the clothing of a layman. He was incognito! Weren’t Campion and his fellow Jesuits just a bunch of lowdown cowards? The bloggers would have had a field day, I’m afraid. Yet at every moment of every day that Campion remained in England he was hunted like a wild animal. The Queen’s men were rarely more than a few hours behind him. He risked his life day and night, week in and week out, just so that he could provide the Sacraments for Catholics who’d been deprived of them. In this way, the Revolution would be undermined, souls would be saved, children would grow up Catholic, the Faith would survive, and the Church in England would outlive the persecution in England. After his arrest, Campion was asked to raise his right hand and take an oath during his trial; he was unable to do so because of the horrific torture he’d already undergone for his refusal to deny the old Faith; one of his companions had to lift his arm for him. Before their ordeal would come to an end, Campion and his brother priests would have their intestines ripped from their abdomens while still conscious, be hung by the neck from the tree at Tyburn, cut down while still alive, and then have their bodies quartered and dismembered. At every step of this ghastly process they were assured by their torturers that all they had to do to make the pain stop was give in, deny the old Faith, admit their guilt. Not one did so. Cowards? Somehow I don’t think so. Today the whole world is warring against Christ, and once again various strategies are being employed by good priests from different orders and fraternities—all trying to save souls, all working for the “preservation and augmentation of the Catholic Faith”. For some it’s direct confrontation; for others it’s quiet but consistent restoration of all things Catholic. Both have noble precedent in the history of Catholic counterrevolution. Both are necessary. Both are clearly part of God’s plan. I doubt very much that Fathers Eshiowu and Sumich are discussing the pros and cons of Vatican II with the Nigerians every Sunday morning; nor are they sniping at the SSPX or involving themselves in all sorts of political intrigue. They are caring for souls, dealing with “distressed consciences”, providing the Sacraments, offering the traditional Latin Mass, planting the seeds of the Catholic Faith—exactly as faithful priests have always done. The Catholic restoration that is in full swing today is an unstoppable reality fueled by God’s grace and carried out by thousands of Catholic priests from dozens of orders and priestly fraternities serving the spiritual needs of millions of disenfranchised Catholics who, in union with the Holy Father, are taking back what was wrongfully taken from them through ill-conceived “changes” in the Church that left most of the Catholic world in ruins. At this critical moment in history, when Christ’s holy priesthood is under universal and diabolical attack, let’s thank God for the tradition-minded priests still in His faithful service—all of them! Anyone wishing to send a donation to help Fathers Eshiowu and Sumich continue their work in Nigeria may do so in care of the Fraternity of St. Peter North American Headquarters, Griffin Road, PO Box 196, Elmhurst, PA 18416.